“Every supply chain provider will tell you their biggest concern is availability of labor and getting a workforce,” said Erik Nieves, co-founder of Plus One Robotics, which is counting on more companies turning to automation. Nieves started Plus One Robotics with Southwest Research Institute alums Paul Hvass and Shaun Edwards to create systems that let robotic arms see. In their Port San Antonio facility, the company has a mock-up of what an automated warehouse line could look like. It includes conveyor belts and an industrial robotic arm. Perched above the arm is an array of 2D and 3D cameras mounted next to lighting. 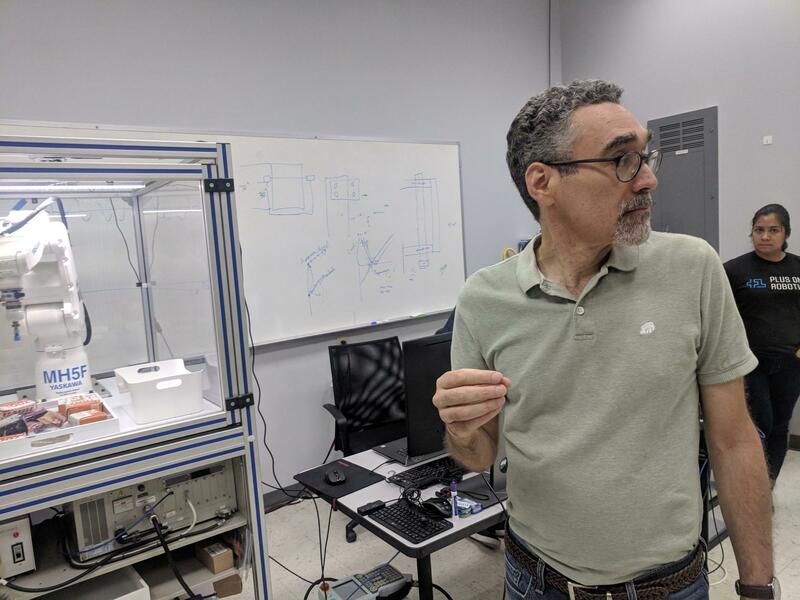 Erik Nieves, CEO of Plus One Robotics, alongside one of their package picking systems. “Ordinary robots aren’t very good at this work,” Nieves said. A river of packages rushes down the conveyor belt when it is flipped on. Padded envelopes and various sized boxes are sitting on top of each other. 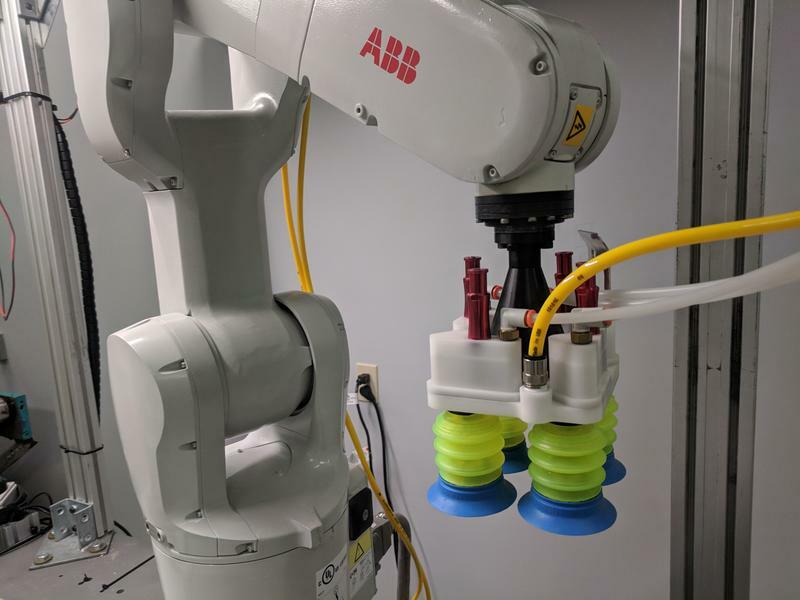 Unlike a factory floor at a Toyota plant, where an arm has the single repetitive action of welds or mounts with elements that are always in the exact same place, this system must see, analyze and grab individual boxes, Nieves said. Nieves said the machine can do 25 picks per minute, the same as a human. Amazon purchased automation company Kiva Systems in 2012. It’s a system that moves the shelves to the human employees to pack boxes. Many logistics companies have figured out how to automate pallet sized shipments. But having the robots sort out individual items for packing or sorting packages on the line is where Plus One and companies like it want to be. 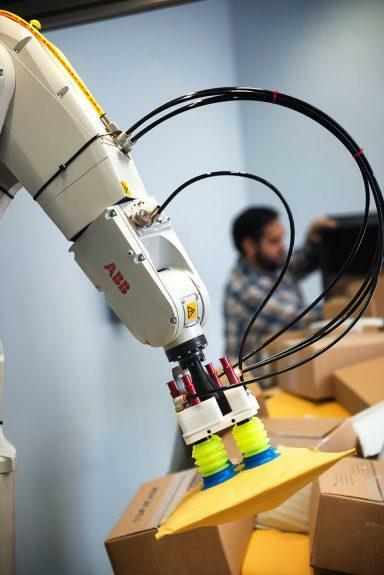 Alex Shikany, with the Robotics Industries Association agrees, saying package sorting and picking hasn’t seen automation the way other areas have. Machine vision system sales are growing, Shikany said. Records were set in 2017, with $2.7 billion in sales. And one report from technology market analysts at Tractica predict worldwide sales of warehouse robots will increase Tractica forecasts that worldwide warehousing and logistics robot unit shipments will increase to 620,000 units annually by 2021, from 40,000 in 2016. “We continue to see sales increase very rapidly for these types of technologies,” he said. Shikany attributes surge in interest to the confluence of several factors, including the drop in price of industrial arms and machine vision components, innovations around soft gripping technology, and low unemployment. Investors are paying attention, too. Soft Robotics, a leader in the field, raised $20 million in May. Nieves’ PlusOne raised $2.5 million in an early round of funding last year. He anticipates the company doubling in size in the next year.